Q: As the Ministry of National Defense of the ROK confirmed that Lotte's golf course in Seongju will be used for the deployment of THAAD, Chinese citizens have started to boycott the Lotte Group. What is China's comment? A: In the past three days I have answered this question many times. First, our position on THAAD is very clear. We are firmly opposed to the deployment of THAAD in the ROK by the US and the ROK. This position is very firm. On your second question about the operations of the Lotte Group in China, I have said that China welcomes foreign companies to make investments and do business in China and protects their lawful rights and interests in China according to law. However, their operations in China must comply with Chinese laws and regulations. I have also said that at the end of the day the Chinese market and consumers will determine whether a foreign company is successful in China. Q: The US government is planning to ignore the rulings of the WTO that it sees anti-US. How do you respond to that? A: I suggest you go to the competent authorities on WTO-related matters. I can give you China's principled position here. Preserving and improving the WTO-centered, rules-based, fair and open multilateral trade regime is conducive to boosting world trade and economic growth and is in the interest of all parties. China will work with all WTO members to safeguard the important status of the WTO in global economic governance and ensure that the WTO will continue to play a constructive role in world economic affairs. Q: There have been concerns that if the US were to walk away from the WTO rulings, other countries might follow suit, including China. What is your perspective? Will China walk away from the WTO rulings? A: As I said just now, China supports the rules-based, fair and open multilateral trade regime with the WTO as its core. China has actively supported the work of the WTO since it joined the organization. This position will not change. Q: The summit of the Economic Cooperation Organization (ECO) concluded in Islamabad, Pakistan yesterday. It stressed promoting regional connectivity. 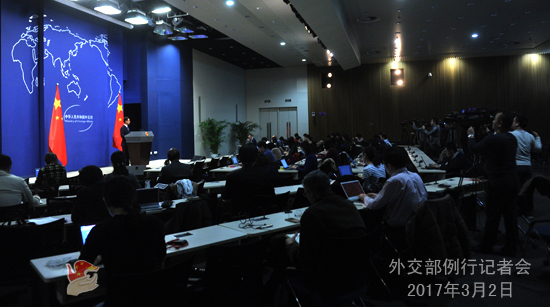 A senior Chinese diplomat was also invited to it. What is your comment on it? A: As a special guest, Executive Vice Foreign Minister Zhang Yesui led a delegation to the 13th ECO summit. The theme of the summit was connectivity for regional prosperity. It will help create fresh energy for regional cooperation. This May, China is hosting the Belt and Road Forum for International Cooperation in Beijing. At the forum the participants will focus on international connectivity cooperation, regional economic growth and common development. Chin takes a positive and open attitude to all initiatives and cooperation that will promote regional connectivity and economic development and is willing to make positive contribution in this regard. Q: The Islamic State (IS) released a video recently. Some terrorists appeared in the video seem to come from Xinjiang. Is the Chinese government at the moment trying to locate their relatives to try and find out more details about these people and how they ended up with the IS? A: I have given some initial response to this question yesterday and do not have further information now. I want to emphasize that in recent years the East Turkestan terrorist forces represented by the ETIM are sending fighters to conflict zones and strengthening their collusion with international terrorist forces, posing severe danger to security and stability of relevant countries and the region. We are ready to work with the international community to continue fighting the East Turkestan terrorist forces. Q: The Lotte Group said today that the website for the Lotte Duty Free was hacked, and they suspected that the cyber attack came from China. Do you have any comment? A: I have noted relevant reports. On the issue of cyber hacking, we have stressed repeatedly that China opposes all forms of cyber attacks and is ready to cooperate with other countries to ensure cyber security. I will not comment on the remarks of the Lotte Group since it is merely their speculation and there is no conclusion yet about what was behind the hacking. On the Lotte Group's operation in China, I just said that foreign companies in China must comply with Chinese laws and regulations. Q: Can you comment on how the land deal affects bilateral relations between China and the ROK? A: I have been stating China's position on THAAD repeatedly in the past few days. 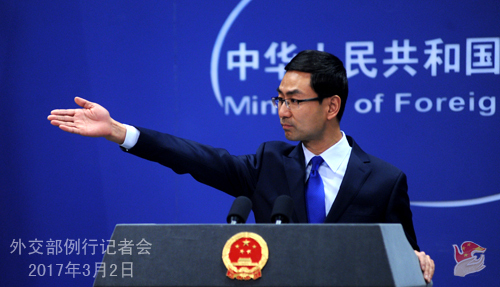 China believes the deployment of THAAD in the ROK by the US and the ROK will severely disrupt regional strategic balance, gravely undermine the strategic security interests of regional countries including China, and will not help ensure peace and stability on the Korean Peninsula. The Chinese side has emphasized repeatedly that we understand the legitimate concerns of relevant parties to uphold their own security , but one country's security shouldn't be pursued at the expense of other countries' security. Regrettably, the ROK, ignoring China's interests and concerns, insisted on working with the US to accelerate the deployment process. 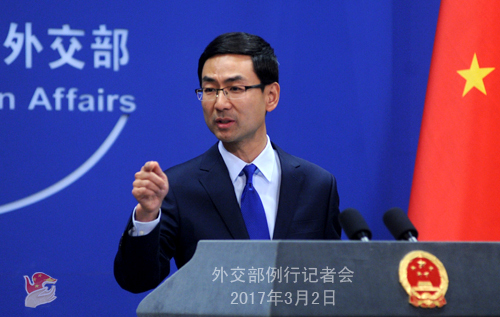 China is strongly dissatisfied with and firmly opposed to that. 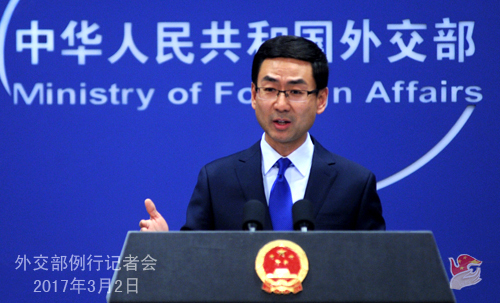 China will resolutely take necessary measures to defend its security interests and all consequences entailed from that will be borne by the US and the ROK. We strongly urge relevant parties to stop the deployment process and avoid causing more negative impact on China-ROK relations and bilateral economic cooperation and cultural exchanges. Q: Do you have any update on DPRK Vice Foreign Minister Ri Kil Song's visit? Is there anything planned for today? A: We have released a readout regarding his meetings with the officials of the Chinese Foreign Ministry. I don't have additional information. As far as I know, during the visit, they still have some arrangements of their own.